Built in 1883, the Victorian Grand Opera House is still in operation and has a few haunts in residence. One is believed to be Percy Keene, a longtime employee here (from 1895 to 1967). He has shown up as a smiling ghost wearing shiny round glasses. Mysterious footsteps have been heard around the building, and apparitions have turned up in theater seats right next to living theatergoers. A ghost dog is said to call the place home as well. When I was in high school in 1995 -1998 I performed at the Grand Opera House in school musicals for 3 yrs and during one year while there for a rehearsal, me and some other students where in the lower seats while others where in the basement area with our music teacher. About 5 of us saw a man with a dog, both see through forms, walk across the stage from left to right. He was wearing a hat but I can’t remember what type. All of us look twice, then to each other, then back to the stage. They were gone. And silently but quickly we ran to the basement. Overall, I believe the ghosts of the Grand to be pretty friendly and would love to go back there some day to investigate again. Would you be able to answer a few questions about your investigation? I’m doing a project for school. For most of my life, my family has celebrated Christmas there! We rent out the Opera House and celebrate Christmas. We also always take a tour. While on the tour my sister saw the ghost dog, my cousin and his uncle saw a couple of mannequins move on their own. There is also a reported ghost light. The light is off all of the time unless a human mass is near it. It turns on a lot while no one is in the auditorium. We stopped renting the place out due to most of the family moving away. I grew up around the Grand when it was a movie theater.. 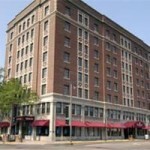 I frequently stayed in the upstairs apartment with the then manager, Mary Vetter. My brother worked at the Grand for years prior and Mary was like family. Mary would let me ‘play’ on stage where I would sing and dance. The rest of the time I could explore. My time at the Grand was from about 1957 till 1967. I worked behind the candy counter from about the age 9 till 15. Growing up there I knew Percy Keene. He was a very nice man and we would frequently share a soda when he would be sitting at the back stage door on a folding wooden chair. He worked when the theater would host local plays. I would love to try and see him again with his baseball cap and silver glasses. He always had a smile and twinkling eyes! In one of the basement dressing rooms there was always a very ominous feeling, and several times I saw a dark shadow figure in that room. I would always run by that room. I had full run of the theater and never sensed or saw a dog; wondering if the construction brought the dog back. It was a wonderful place to play as a young girl. There used to be a secret door from the upstairs apartment to the balcony which I thought was really cool. So you could go from Mary’s office to the balcony right next to the projection booth. You could also go through the apartment and exit on the balcony landing. There was a door in the basement in the woman’s rest room where you could walk below the entire auditorium and enter the backstage area. Loved my time at the Grand! !